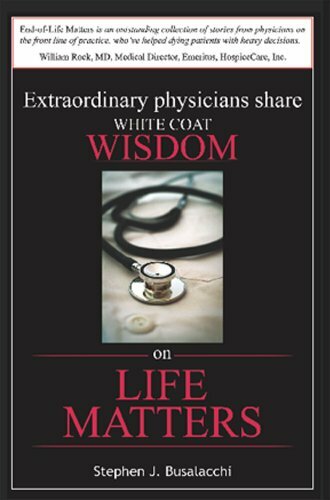 Life Matters by Stephen J. Busalacchi offers real-life physician experiences with end-of-life care, which can provide meaningful lessons for all of us. Life Matters by Stephen J. Busalacchi features physicians who discuss their experiences with dying patients. It is a must read for those who wish to die peacefully. "End of Life Matters is an outstanding collection of stories from physicians on the front line of practice, who've helped dying patients with heavy decisions." William Rock, MD, Medical Director, Emeritus, HospiceCare, Inc.
President Obama is right: We need a national conversation about end-of-life care. This 72-page primer that features physicians who've experienced these matters, is an excellent start, and may well be the most important investment you ever make. What could be more important than avoiding a death that does not honor your wishes? Preparation is the key word, and these doctors explain in fascinating anecdotes why that is so important.